Saturday Feb 12 2005: Frozen Hoops provided you the "inside scoop" on the Calgary Drillers. More than 20 pages of information. Several of our articles were published in newspapers and mentioned on TV along with republished in prestigious hoop websites like oursportscentral and USbasketball. Now that the Drillers are on a hiatus we will keep you informed on their future in the ABA along with the proposed Montreal and Vancouver team for the 2005-2006 season. Wednesday Feb 23 2005 Calgary Drillers Accepting Resumes for Head Coach/Director of Basketball Operations for 2005/2006 02/23/05 - American Basketball Association (ABA) Calgary Drillers The Calgary Drillers are happy to announce we are accepting resumes for the positions of Head Coach and Director of Basketball Operations for the 2005/2006 season. Preference will be given to qualified Albertans who fully supports the overall developement of basketball in the province and across the country of Canada. This is a full time position which would commence May 1,2005. Applicants are urged to send their resumes by e-mail to al@calgarydrillers.ca. For more information contact the Drillers office at 403.243.2252Indianapolis, IN. I have received many emails and calls from Calgary Driller fans and media asking what happened to the Calgary Drillers and why they suspended operations. Fair questions. First, Calgary is a tremendous sports city and you embraced the Drillers from day one. We are deeply apreciative of the interest and support you showed. The problem was travel - getting ABA teams to Calgary - getting Calgary on the road. It was just too difficult both ways. The ABA wants very much to be in Calgary and is working on a plan to make that happen next season. The Calgary Drillers Basketball Club, Inc. and the ABA are working to develop a team in Edmonton for next season. With a second team in Alberta, it would then be feasible for northwest division ABA teams to make the road trip and to play several games before returning home. It would also create an excellent rivalry between the two teams in Alberta. The Drillers and the ABA are working with a couple of different potential ownership groups to own the Edmonton team and believes that this can be accomplished in the next few weeks. We are also looking at creating a community ownership structure similar to how several CFL teams are operated. The addition of Edmonton to the ABA would enhance the long history of intense rivalry between the two Alberta cities and would encourage the growth of the ABA across the province. It would be anticipated that Calgary and Edmonton would play one another several times during the season. We have also been assured by the Calgary Drillers Basketball Club, Inc. that they are working to resolve the unsettled business matters of the past season in Calgary. Once again, Calgary, the suspension of the ABA team there was through no fault of your great city. And there's nothing we'd like more than to return. Thank you for your support. Joe N. Commish For more information, contact al@calgarydrillers.ca, visit www.calgarydrillers.ca or call 403 243 2252 or visit www.abalive.com. The Calgary Drillers Basketball Club is working hard to ensure an ABA franchise is located in the city of Edmonton Alberta for the 2005/2006 season. The presence of a franchise in Edmonton is critical to the long term success of professional basketball in Calgary and the province of Alberta. Drillers Close Shop - For Now? Saturday Jan 22, 2005 Salt Lake City, UT - Curtis Millage and Tony Farmer kept the Utah Snowbears close, Harold Arceneaux gave them the lead, and Clay Tucker finished off the Calgary Drillers as Utah overcame a 13 point Drillers lead to win their 21st straight consecutive game 114-107. The Drillers return to Calgary late tonight. Their weekend games against Washington have been postponed due to weather uncertainty in Washington and B.C. Calgary led went on a 15-2 run at the start of the game behind 18 points from Brian Lewin and Damian Owens. Millage came of the Snowbears bench and scored 15 first half points to keep the game close. Melvin Whitaker added 9 in the second quarter to spark the Drillers to a 56-52 halftime lead. Jared Ramirez broke out of his cold shooting streak with 8 points in the 3rd, while DeJaun Wheat and Nate Driggers combined for 18 pints in the quarter to carry the Drillers to an 86-77 lead after three periods. But Utah dominated the boards late in the third and into the fourth as Utah cut Calgarys 13 point lead to one before technicals on Drillers Coach Otis Hailley and Center Brian Lewin allowed Utah to take the lead for good at 92-91. Harold Arceneaux got Utah the lead with 16 points in the quarter, and Clay Tucker added 10 down the stretch with 7 coming on free throws in the final minutes. Utah outscored Calgary 37-19 in the fourth quarter, and outrebounded them 20-4 in the period as well. Utah made 9 of 12 free throws in the final minute to finish off the win. Arceneaux finished with 29, while Millage and Tucker had 23 and 22 points respectively. Brian Lewin led 7 Drillers in double figures with 20. Wednesday Jan 19 2005 Neither rain, nor sleet, nor flu bug would keep the Utah Snowbears from its appointed wins. Clay Tucker fought off flu symptoms and made up for less than stellar free point shooting with 5 key points down the stretch to lead Ike Austin's Snowbears to its 19th win in a row. James Penny was all over the place for Calgary, scoring 7 points in the first quarter. Tyrone Hayes matched Penny point for point off the bench for Utah, while Tony Farmer added 6 points in a reserve role as well. After the teams traded 7-0 runs, Utah led after one period 28-26. Utah got more balance in the second quarter as Farmer, Hayes and Tucker all finished the half in double figures as they ran the Drillers into fatigue. The Snowbears went on another 7 point run and led at the half 54-41. Jermaine Mason put his stamp on the game in the third, as he and DeJuan Wheat had several key threes and steal to make a run for Calgary. The Drillers got as close as 3 points before Harold Arceneaux took over with 9 points in a key run to give Utah an eleven point lead after three periods. Calgary used the defense of James Penny and Damian Owens to make a game of it. Owens and Penny both had steals and baskets to close the game to within 3 points. Wheat had 7 points in the 4th, while Owens blocked shots and scored 10 points as well. But Utah had too many answers, as Arceneaux hit a big jumper, Hayes had a rebound and slam, and Clay Tucker made key free throws as Utah improved his record to 19-0. Tucker finished with 24 points and 10 rebounds, while Tyrone Hayes added 24 points and 9 rebounds off the bench. Harold Arceneaux added 23 points to go with his 9 rebounds, while Tony Farmer had a 13 point 10 rebound double double. Nate Driggers had a double double of his own with 13 points and 10 rebounds, while James Penney led the Drillers with 24 points. Dejuan Wheat added 18, with Jermaine Mason and Damian Owens finished in double figures with 15 and 17 respectively. The same two teams will meet again Wednesday Night, and the game can be heard on the Snowbears web site at www.utahsnowbears.net, or on 1550 am in Salt Lake City. The two teams return to Salt Lake on Friday for one game at 7pm and Salt Lake Community College. Tickets are available at the Snowbears office at (801) 533-2327. For more information, visit the web at www.utahsnowbears.net. Saturday Jan 15 2005 Drillers Win Third in a The Calgary Drillers put up big numbers for the third consecutive home game in beating the Portland Reign 119-81 Saturday evening at the Corral. The win, Calgary’s third straight boosts their record to 4-7, the Reign head back to Oregon 4-8. The Drillers led by more than 20 at the half and almost doubled the advantage in the second half before close to 900 fans. Calgary has now scored more than 400 total points in their last three games. Both teams were playing shorthanded. Calgary’s Damian Owens and Portland’s Anthony Pelle were handed one game suspensions under the ABA’s Zero Tolerance policy. Both players threw punches in a mild melee on Friday night, but that act means an automatic one game suspension in the ABA. Nate Driggers paced the Drillers again with 27 points. Calgary’s other NBA veteran, DeJuan Wheat was equally effective with 26. Melvin Whitaker and Jerrick Oliver each had 8 boards for the Drillers. Terrance Green hit for 26 points for the Reign. The Drillers meet the first place and unbeaten Utah Snowbears on Tuesday and Wednesday at the Corral. The Bears are an ABA leading 17-0. Tuesday’s game is a Two for One Tuesday with fans receiving one free ticket for each one bought. Friday Jan 14 2005 American Basketball Association (ABA) Calgary Drillers The Calgary Drillers played before their largest crowd of the season and didn’t disappoint in a 132-100 win over the Portland Reign on Friday night. The Drillers scored more than 130 for the second straight game in improving their record to 3-7 in front of 1,132 at the Corral. Nate Driggers led the Drillers attack with 29 points and 6 boards. Jerrick Oliver added 21 with 5 boards while Melvin Whitaker led both teams with 11 rebounds. Portland’s John Outlaw had 25 points for the Reign who saw their record fall to 4-6. The two teams play the second half of their doubleheader at 4 p.m. on Saturday. Once again all adult tickets are $11.00 and all children’s tickets $5.50. Friday night’s game also marked the debut of the first Albertan to play in the ABA. Calgarian Emmanuel Chiek scored his first ABA point late in the Drillers win. The former SAIT and University of Saskatchewan star signed with the Drillers on Friday night. Thursday Dec 16 2004 Commentary The Calgary Drillers may have set a new record for a professional sports debuting in it's first week of competition. Traveling from Calgary Alberta to Fort Worth Texas to Harlem New York to New Jersey and then to Portland Oregon and back to Calgary and if they did that in a direct line they would have put on 5,100 miles! Here are the estimated distances Calgary to Fort Worth 1525 miles; Fort Worth to Harlem 1401 miles; Harlem to Portland 1610 miles; Portland to Calgary 553 miles. Strange how the ABA would simply not schedule them to play against teams that are in their (red) division? Calgary to Salt Lake 723 miles, Salt Lake to Portland 553 miles, Portland to Bellevue 436 miles, Bellevue to Calgary 436 miles. For a total of 2,148 miles as the crow flies saving 3,000 miles travel? Maybe it’s the penalty for late entry? Unbelievable? December 16, 2004 - The Calgary Drillers played their first game in ABA history on Thursday night and couldn?t keep pace with the seasoned Texas Tycoons. The Tycoons, who have been playing regular season games for a month, beat the Drillers 118-91 in Dallas, Texas. Calgary last saw game action over a week ago when they scrimmaged against the University of Calgary. The unfamiliarity with ABA rules hurt the Drillers late in the first half. The Tycoons broke open a 4 point game in the final minute of the half with consecutive four point baskets. In the last minute of each half in the ABA, a backcourt steal adds a point to each shot and Texas sank back to back ?threes? off a full court press for 53-40 half time lead. Former Boston Celtic Nate Driggers scored 24 points with 5 boards for the Drillers. Damian Owens almost matched that feat for Calgary with 24 points and 4 rebounds. The Drillers continue their hectic five game road trip in Harlem, New York on Friday night against the Knights, then meet the first place New Jersey SkyCats in back to back games on the weekend, making it four games in four nights. Calgary then heads to Portland, Oregon to face the Reign before heading home for Christmas. The Drillers then play three more on the road during Christmas week before coming back to Alberta for their home opener on January 2nd. They then play 10 more games at home in January. Details on Drillers tickets and their playing venue will be announced early next week. December 16, 2004 - For Canadian Basketball Hall of Famer Ruby Richman it?s his third ABA team. This time, however, he is the General Manager of a team in his own country. After a year in Chicago and two more in Las Vegas Richman now leads the first Canadian franchise in the American Basketball Association, the Calgary Drillers. The Drillers finally start their 2004-2005 season with an extended road trip this week that will take them to Dallas (Texas Tycoons), New Jersey (New Jersey SkyCats), Harlem (Knights) and Portland (Portland Reign) before Christmas. Calgary will play their first home game the first week of January 2005. The historic Corral, former home of the WHA Calgary Cowboys and WHL Calgary Hitmen will become the home base for the Drillers. On the court head coach Otis Hailey has assembled a veteran team led by former Boston Celtic Nate Driggers. The 6?6? forward from Montevallo College in Alabama will anchor a Drillers team that features two of the tallest players in the ABA, 7?3? center Luke Minor, a product of the Michigan Wolverines program and 6?10? center Mark Evans from Rhode Island. USBL star James Penny will join the team in Dallas for their season opener against the Texas Tycoons. It should be quite the homecoming for Penny was had an outstanding career at Texas Christian University. Defensively the Drillers are led by 6?2? guard Willie Murdaugh of South Carolina. The former Spartans star is no stranger to playing in Canada having previously played for Coach Hailey with the Saskatchewan Hawks where he also was 8th in the CBA in scoring with an 18.7 point average. The Drillers will announce their complete home schedule and ticket information on Monday, December 20th. January will be their busiest month with 10 home games. Saturday Dec 4, 2004 (7:05 p.m.) Calgary Sun has a good story on the Drillers (check link below) and unlike Frozen Hoops took the safe road by not naming any players on the team roster. Probably because no one really knows - even the Drillers - who is on the official roster. It changes day-by-day. 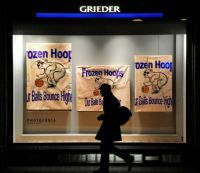 Frozen Hoops has gone out on the limb and taken the word of Otis Hailey. Most of it is what if's and maybes. That is the nature of their operation and league But it is fun to generate interest. The team roster that was mentioned a few weeks ago would have had the best starting five in the ABA...hands down. The team roster menrtioned most recently would probably have the worst starting five in the ABA. You gotta love it. Saturday Nov 27, 2004: Horray! It's finally up and running the Calgary Drillers website www.calgarydrillers.ca. The colour scheme is nearly identical to our site Frozen Hoops and catchy. Drillers' Head Coach Otis Hailey told me originally that the site would be up by Thursday Nov 19 but better late then never. The key now is to start filling in the blanks ASAP with player profiles...game schedule...photographs...ticket purchase info and most importantly Calgary Drillers merchandise! Friday Nov 26, 2004:Indianapolis, IN. The ABA professional basketball league today announced that the Calgary Drillers will be added to the ABA schedule and will play this season. According to Joe Newman, ABA co-Founder, "We know it is late and the season started. However, due to scheduling and transportation problems, it was necessary to delay the start of Calgary's season. They can quickly make up the games and play a full season." Newman added, "The team has made some excellent personnel decisions, including well-known attorney and Canadian basketball figure R. Ruby Richman as President/General Manager of the team. Otis Hailey will be Head Coach; Sean Tyson Asst Coach and Director of Player Development; and Kelly Hazelgrove as Athletic Trainer. The team has just signed Damien Owens, a 6'6" guard/forward from West Virginia; Jerrick Olliver, a 6'7" guard/forward from McNeese and Rodney Bass, a 6'6" guard from Texas Tech. Richman stated, "We have our work cut out for us but within a few days, we'll be ready to roll and we will be very competitive." For more information, contact Kelly Hazelgrove at 403 998 2480 or email to k_d_h34@hotmail.com, Sean Tyson at 403 383 2480 or ohaileyaba@yahoo.com or visit www.abalive.com. Indianapolis, IN. Joe Newman, ABA co-Founder, today announced that the ABA will be expanding to Montreal, Canada in 2005. According to Newman, "There has been just too much publicity about Montreal not being able to support professional sports. Our feeling has always been that the problem does not lie with the city, but with the team. Montreal is a great city and will support professional sports if you give the fans a quality product at affordable prices. That's the ABA - and we have no doubt the fans of Montreal will love the exciting fast-paced high scoring ABA games - and the very affordable ticket prices." The team will be owned by Sports Franchise Acquisition Corporation, with the principle co-owner being Serena Locker-Coles, a well-established businesswomen and a native of Montreal. Mrs. Coles added, "The ABA appears to be a league of opportunity with so much diversification of ownership including women owners. We are extremely excited about this opportunity and echo Mr. Newman's sentiments - Montreal is a terrific sports city if you give the fans a quality product. My partners and I intend to do just that." For more information, contact Serena Locker-Coles, 703-942-7449 or fax 703-942-7450 or email locker02s@aol.com or visit www.abalive.com. E-mail (8:05 a.m.) from Joe Neumann head of ABA in regards to Calgary Drillers situation: "Calgary is confusing. I'll try to clear it up. Calgary will play this season. Their original schedule was assigned to Visalia CA for travel reasons for both home and away. We are reworking the Calgary schedule to make it easier for them on the road, and easier for teams to visit there (because of the distance)." Excerpts from Canadian Press story Monday Nov. 15, 2004: (CP) One of the ABA's targets is Montreal, a notoriously fickle and unforgiving market that has seen pro basketball, Major League Baseball and even junior hockey teams bolt. Montreal businessman Alain Lord is getting involved in trying to bring the ABA to Montreal, where the NBL's Montreal Dragons folded after 17 games in 1993. Lord contacted the league last month to express his interest in paying the $10,000 US franchise startup fee. He said he's willing to build a new, 10,000-seat arena himself with one caveat - he wants to the city to give him the land for free. Lord also says he doesn't want land in the city's east end, where the Expos struggled for years in cavernous Olympic Stadium. The city's two existing medium-sized venues aren't options, said Lord, because they're governed by city contracts that funnel all profits from food sales straight to city workers. "In professional sports, what is your first source of revenue?" he asked in a recent interview. "It's concessions, merchandising, tickets. So if you don't have the concession money, how can that work?" In the same above CP feature ABA commisioner Joe Neumann had this to say: The Calgary Drillers, owned by Hall of Famer Ruby Richman, are Canada's first and only entry this year in the ABA, which is undertaking an ambitious 30-team expansion effort. While the league's visibility in Canada is virtually nil, co-founder and chairman Joe Newman says he plans to bring teams to three of Canada's largest cities by next year. "Calgary will play this year, Vancouver and Toronto in 2005 and hopefully Montreal," the longtime basketball enthusiast said in a telephone interview from league headquarters in Indianapolis. "We have to market it properly, there is no doubt in my mind that Montreal or Toronto or Calgary or Winnipeg or Vancouver will welcome it." BREAKING NEWS Just got off the phone 3:50 p.m. Friday Nov. 5 with American Basketball Association Calgary Drillers GM Ruby Richman and here is what he has to say about the current team situation. "We are working on it (home opener Nov. 16, 2004 against the Utah Snowbears) right now but the facility (Calgary's Stampede Corrall) we are dealing with have other things going on. The plan right now is to start on the road (at Utah Nov. 19) and probably come back here in December. But to be honest we are making a decision next Tuesday (November 8, 2004) whether to postpone the (2004-2005) season and come back ready for next year 2005-2006," says Ruby Richman, GM of the Calgary Drillers. Wow. The Drillers have signed four hi profile players that may be the best four on the floor in the entire ABA with James Penny, Jai Pradia, Willie Murdaugh and Nate Driggers. Also signed is Kevin Norris. Forget about Vince Carter or the Toronto Raptors holding the key to unlock the age of enthusiasm in Canadian basketball. If the door is to be open, it will be thanks to the American Basketball Association’s Calgary Drillers. Calgary has dribbled into the semi-pro realm before with the Calgary 88s' - World Basketball League (1988-1992) reaching the finals three times – and the short-lived Calgary Outlaws (1994 National Basketball League), but this time around their success on the hardwood will be of greater importance. Despite one of the largest expansions in North American semi-pro sports history, 28 teams this past summer, the 35-team A.B.A. has secured several major media outlets and with that in mind, some reassurance. The Drillers, who will play in the Stampede Corrall, will probably have one of the strongest ABA rosters thanks to owner/coach Otis Hailey. Hailey has the longest tenure of professional basketball coaching on Canada soil having called plays for the Montreal Dragons, Saskatchewan Hawks and the Vancouver Nighthawks. Hailey was an assistant coach with the ABA's Tijuana Diablos last season. "This is where I want to finish my coaching career," says Hailey of the city of Calgary and the ABA franchise. "Calgary has strong support for (semi-professional) basketball in the past and I have nothing but positive vibes about the community and it’s support. "There are a lot of knowledgeable fans here in Calgary plus a strong base of Americans living here from places like Dallas and Houston." Hailey, a coaching veteran of 30 years who first came to Canada from Bakersfield, California in the 1980s' to play for the traveling comedy squad the Harlem Clowns, said there will "probably be Canadian player(s) on the team," but added, "we will not keep a Canadian player just for sake of having one just on the principle that they are Canadian. If he makes the team he will be on it because he deserves to be." Canadians mentioned include 6-foot-1 Jamie Charlton (University of Saskatchewan Huskies and Midwest Basketball Association Buffalo City) and former national team member 6-foot-0 Novell Thomas who also played semi-pro with the Buffalo City Thunder. Names already mentioned for the Calgary team include former NBA Vancouver Grizzly and Washington Wizards veteran 6-foot-5 Lawrence Moten (Syracuse), 6-foot-6 James Penny (Texas Christian University and USBL Oklahoma Storm, 2004 leagues 6th leading scorer 19.7 and sixth in blocked shots 1.6) 6-foot-10 Kelly Wise (U of Memphis and CBA Grand Rapids Hoops) and Andre McCollum (a 1999-2000 International Basketball Association All Star and basketball gypsy who has played in the CBA, NBDL and most recently overseas in Israel). Hailey also mentioned former NBA players Todd Day and DeJuan Wheat signing possible deals. Add to the mixture the hiring of Ruby Richman, a legend in Canadian hoops, as General Manager and you have a strong base. With 2005 expansion slated for a possible 16 teams, including Vancouver and possibly Montreal, look for Edmonton, Saskatoon and Winnipeg to return to the semi-pro scene. Alberta has had the Outlaws, 88s’, Alberta Dusters (Lethbridge, Continental Basketball Association) and the Edmonton Skyhawks (NBL) and this past summer the Ontario Professional Basketball Association made an attempt at stimulating the game north of the 49th parallel but quickly folded. "We will be playing in by far the strongest division (Red/West)," says Hailey of the 11-team division which includes teams in, among other places, Los Angeles (Stars) Las Vegas (Rattlers), Long Beach (Jam) and Portland (Reign). "The fans will be entertained...we guarantee that"
The Drillers open their season on Nov. 16 hosting the Utah Snowbears a team Hailey had tentatively signed on to coach last April before relocating to Calgary. PLEASE STAND FOR THE PLAYING OF "OH CANADA." Indianapolis, IN. Joe Newman, ABA Co-Founder, today announced that Calgary Alberta, Canada would be the 27th expansion team in the league this season. According to Newman, "Our goal has been to expand in Canada, especially with three teams in Mexico. We were waiting for the right opportunity and were thinking 2005. But the new ownership group, headed by Calgary businessman Spero Kokkans, wanted to play this season and felt that they could put things together quickly. So, here we go again." Newman added, "Mr. Kokkans brought in two people to spearhead the operation naming Otis Hailey as Co-Owner/President and General Manager and Ronald Pryor as VP/Director of Operations. Both bring with them considerable basketball experience and expertise and have confidence of being able to jumpstart operations for a successful team." Hailey has over 30 years experience as a professional player and coach most recently having coached the ABA Tijuana team. Pryor is a professional basketball scout. Hailey added, "We know it is late and that we have only a few months before the start of the season. But Mr. Kokkans and his investment group are helping us put together a very talented staff and providing great assistance. The city of Calgary is very excited though we haven't even made the official announcement and the calls and emails have been overwhelming. Ron and I are confident that we'll have one of the best operations in the league and appreciate the ABA letting us start this late. But we're moving ahead full steam." Pryor added, "We haven't even had time to name the team. I think we'll have a Name the Team Contest and we are already scheduling some tryout camps and putting together our staff. We'll be making many more announcements shortly. But if you have a good idea for a team name, please email it to us; we'll award some season tickets to the winner." For more information, call Otis Hailey at (306) 249-3146 or email ohaileyaba@yahoo.com or call Ron Pryor at (469) 877-5282 or fax (817) 640-2012, email ron_pryor@yahoo.com. Calgary - The city has been awarded an American Basketball Association team, which will begin playing this fall. Calgary is the 27th expansion franchise to be granted by the ABA for the upcoming season. Vancouver is also among the new clubs. The league had seven teams last season. Calgary businessman Spero Kokkans heads the local ownership group. Otis Hailey will serve as co-owner, president and general manager, while Ronald Pryor is vice-president and director of operations. The team will begin league play in November. Hailey has over 30 years of basketball experience, most recently as coach of the Tijuana ABA team, while Pryor is a professional scout. "The city of Calgary is very excited, though we haven't even made the official announcement, and the calls and e-mails have been overwhelming," Hailey said in a release. "Ron and I are confident that we'll have one of the best operations in the league and appreciate the ABA letting us start this late. But we're moving ahead full steam." Pryor said there would be a contest to name the team. June 19, 2004 - Vancouver, BC. John M. Brazier, Co-owner, CEO and Director of Basketball Operations of the new ABA Vancouver professional basketball team today announced the signing of Jim Harrick as Head Coach. According to Brazier, "Vancouver is a major league city and deserves a coach with major league credentials and ability - Jim Harrick fits both - and will help make Vancouver one of the premiere teams in the ABA." Harrick had a 470-235 record in 23 seasons as a collegiate head coach. He has taken four schools to the NCAA Tournament. During his stints at Pepperdine, UCLA, Rhode Island and Georgia, Jim built outstanding teams, winning championships at each stop, and reaching the NCAA Tournament an amazing 16 times. His UCLA Bruin squad racked up 31 wins and captured the NCAA National Championship, gaining him honor as 1995 National Coach of the Year. Harrick added, "This is a great opportunity for me. Vancouver is a first-class organization, the quality of play in the ABA is outstanding as is the coaching. Our team will be predominatly Chinese. We have great talent coming in - and we will be very competitive. This will be both fun and interesting and I am looking forward to the challenge." June 3, 2004 - Vancouver, BC. John Probandt, Co-Owner of the ABA's new Vancouver professional basketball team today announced that John M. Brazier has been appointed CEO and Director of Basketball Operations. Probandt stated, "John provides us with the perfect combination of sportsman/businessman, a man who has had success in every endeavor in which he has been involved. He'll lead our organization well." A native of Seattle, WA, Brazier attended the University of Washington where he played football and track. Upon graduation, he served two years in the U.S. Navy on a cruiser in the Pacific. Following his service, he entered the forest products industry and established Brazier Forest Industries that owned and operated sawmills, lumberyards, a door plant, and a laminating plant in Washington, Oregon, California, Hawaii and British Columbia with sales offices in western Europe, Japan, Australia and Vancouver, B.C. Recently, Brazier joined Rising Star Holdings as Vice President of Marketing prior to being appointed CEO of the basketball operations. Brazier added, "As you know, our team will be very unique with almost all of our players being Chinese. We've spent considerable time in China and have no doubt that we'll be very, very competitive. The talent is extraordinary. Vancouver is a great basketball city and deserves a high quality organization. I think fans will love the ABA style of basketball and will be very impressed with the quality of play. We're looking forward to the challenge." For more information, log onto www.abalive or email John Brazier at j.brazier@verizon.net or usainvesting@yahoo.com. Vancouver BC. The new ABA Vancouver professional basketball team has announced that Jamian Lai will be its new President/GM of Basketball Operations. Lai will be responsible for overseeing team operations including scouting, marketing, merchandising and overall business development for the new team. Lai brings a strong international background in finance, marketing and media from the US and Asia. Lai studied at Harvard University and Beijung University and speaks both English and Chinese. Vancouver team co-founder John Probandt stated, "Jamian has the idea background to successfully build our Vancouver team from both a local and global perspective. His international experiences in business development, marketing and media relations are important to achieve the global vision of our basketball organization." "Jamian's global experiences and connections in the sports and entertainment world will help establish Vancouver and the ABA to fans around the world. Given his background, Jamian has the ability to bring a unique perspective with tremendous value to our franchise, fans, partners and the ABA," added Vancouver team co-founder Weiqing "Walter" Huang. Lai stated, "I am very excited at this opportunity to put Vancouver basketball on the world map. We look forward to cultivating strong relationships with the local community, as well as bringing a truly international flavor to the ABA." "We aim to build a winning team that will bring fun and excitement to basketball fans around the world, especially in Asia. Basketball growth has been impressive in China, and we believe there is enormous potential from both a talent and market outlook. I believe our team will represent the future direction of basketball and sports in the 21st century," Lai added. Finally, Lai stated, "I believe Vancouver will enthusiastically welcome the fast-paced, thrilling brand of ABA basketball that is appealing and affordable to friends everywhere." Vancouver is planning a press conference in the near future to announce the venue, personnel, coaching staff, team development and other details, including the new team name. For more information and inquiries about the ABA Vancouver team, log onto www.abalive.com or contact Jamian Lai directly at jamian@post.harvard.edu. Calgary has been home to two former pro basketball teams. The Calgary 88's of the World Basketball League from 1988-1992 and the Calgary Outlaws of the National Basketball League in 1994. Association in November 1987, but changed its name prior to the 1988 season. Some of the feature players for the Calgary 88s' included Carlos Clark, Dave Henderson, Chip Engelland, Jim Thomas, Sidney Lowe, Perry Young and David Boone. Coaches for the team were Mike Thibault, 1988, Cory Russell, 1989 and Roger Lyons, 1989 - 1992. A cornerstone franchise for the WBL, the 88's reached the league finals three times. Although the team never won a WBL title, Calgary posted the league's best regular season record in 1988, 1989, and 1991. In five seasons, the 88's went 151-78. Former Calgary 88s' player Sidney Lowe was head coach for Memphis Grizzlies and Minnesota Timerwolves. Calgary teammate Chip Engelland is now a assistant coach with the Denver Nuggets. NOW: Best sportscaster in television. 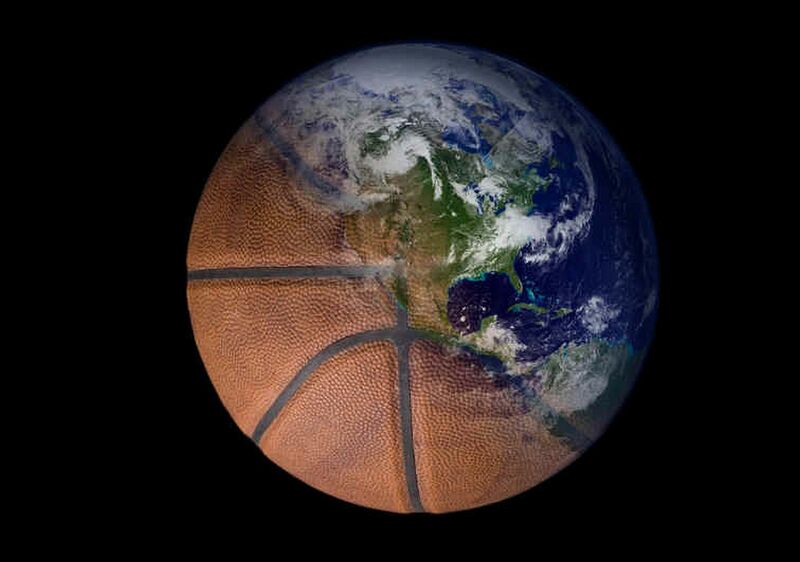 Assigned to the 2000 NBA Finals, the 2000 Major League Baseball All-Star Game, and the1999 World Series (NBC). THEN: Rookie radio and TV announcer for the ABA Spirits of St. Louis. Almost assigned by Marvin Barnes to wash Marvin's Rolls Royce in the St. Louis Arena parking lot. NOW: Basketball color commentator for NBC and the Portland Trailblazers. THEN: High-scoring All-Star guard for the New Orleans Bucs, the Memphis Pros, the Dallas Chaparrals, the Denver Rockets, and the Spirits of St. Louis. NOW: Head Coach of the Milwaukee Bucks. THEN: Guard for the San Antonio Spurs. Member of the ABA's All-Time "Big Hair Team." NOW: Head coach of the Ohio State Buckeyes. Led the Buckeyes to a 1999 Final Four appearance. THEN: A speedy guard for the Pittsburgh Condors, Kentucky Colonels, and San Diego Conquistadors, known as "O.B." Helped lead the Colonels to the 1973 ABA Finals. NOW: Recent coach of the Philadelphia 76ers. Current Head Coach of the Detroit Pistons. THEN: Head Coach of the Carolina Cougars and Denver Nuggets. NOW: Recent coach of the Detroit Pistons. THEN: Sharpshooting Guard/Forward for the Virginia Squires. Skinner -- Head Coach of the Boston College Eagles. Erving -- Executive Vice President of RDV Sports (parent company of the Orlando Magic). Erving & Skinner -- Teammates on two New York Nets ABA championship teams. NOW: Men's College Basketball Analyst for ESPN. 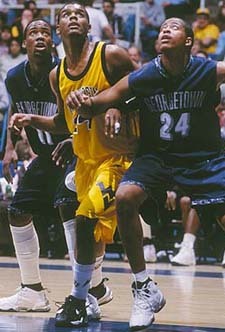 THEN: Forward/Center for the Indiana Pacers.